SlimCleaner is a system cleaning and maintenance utility with an original twist: it makes use of user ratings from the developer community to help you decide which items should be removed. The main tool in SlimCleaner is, obviously, the cleaner. It’s a highly-detailed tool that works with a wide variety of applications and also takes care of temporary files, history logs, lists of recently opened documents and other unnecessary elements. The cleaning process is fast and effective. But that’s not all to SlimCleaner. The program also features an optimization tool to analyze start-up items and active services, an uninstaller and a shredder that helps you get rid of files securely, to prevent their restoration. Finally, the Hijack Log in SlimCleaner displays a list of toolbars, browser helper objects, ActiveX plug-ins and other items, while the Windows Tools area include the native Windows system analysis and optimization tools, though presented in a much more organized and attractive way. SlimCleaner features an eye-catching nice interface design with bright colors, big animated icons and easy menus. User ratings can be really helpful when trying to decide if you should get rid of a certain item – though unfortunately there are still many programs that don’t have ratings. Another drawback to SlimCleaner is the lack of advanced configuration options. SlimCleaner removes all unnecessary items from your computer to improve the system’s performance and stability. it did not work for me. I paid for the fee for a download and every time I try to use the program it wants me to pay again. I ask for money back , but so far they have not done so after several asks. This product is a bad buy.. Dont buy this. It is scam! I bought this and ended up having to go to my computers manufacturer to have it fixed! the tech support is imposssible to contact and when you do happen to get a hold of them they are rude and try to get you off the phone one guy even hung up on me. its just always better to go through your computers manufacturer. Stay away from 3rd party software. Plus it makes it way harder on you trying to figure out where a problem might be if you have a bunch of different software. and therefore a bunch of separate tech support. Great Maintenance App. 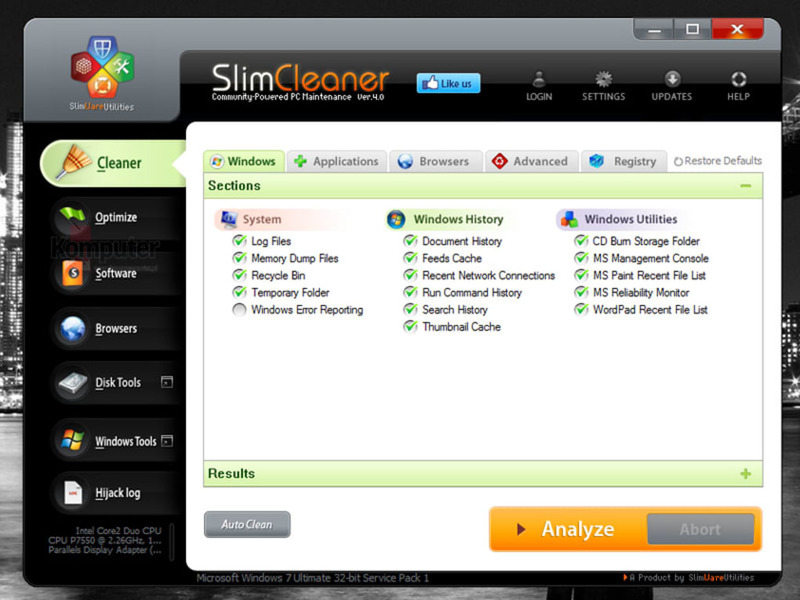 SlimCleaner is just like CCleaner with some added features. It has cloud antivirus to scan unknown apps in it's optimization section. It tells you which apps are good as well as which apps are optional and which are unknown meaning they haven't been submitted yet. I have also found it does a better job at cleaning than CCleaner. The downside to SlimCleaner revolves around it's optimization section. It's both a good and bad thing. It's great to tell you which apps are good and which are optional as well as scanning apps to show which are safe. However if disable or remove the wrong things in the optimization section you could have some serious computer problems. Overall I love this product. It has become my preferred cleaner replacing CCleaner. I recommend this product to everyone. However I'd recommend leaving the optimization section alone unless you know a lot about computers. Has Cloud AV Built In. Lists If An App Is Good, Bad, Optional or Unknown. What do you think about SlimCleaner? Do you recommend it? Why?